Mark and Sandy Martin of Sandmark Custom Homes came to the rescue when my first floor flooded. Sandmark Custom Homes did an excellent job gutting and rebuilding the flooded area. Sandmark Custom Homes stayed on schedule, offered suggestions on improving the damaged space and returned calls promptly. The job was completed and I couldn’t have been happier with the outcome. 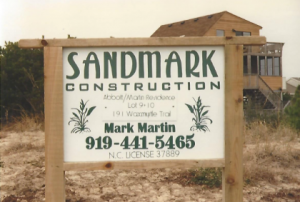 I would recommend Sandmark Custom Homes and use them again for any building, repair or remodeling needs. Sandmark Custom Homes is grateful for all of our clients and their feedback to help our company to be the best it can be. We are thankful for the time we have been able to spend with Linda rebuilding her home after the flooding. If you’re interested in starting a home renovation or building project along the Outer Banks, contact Sandmark Custom Homes at (252) 261-1123 or email us at sandy@outerbanksbuilders.com. We are happy to answer any questions you may have.